Gotalotta dem circular Lincolns too. Sheesh. Having their faces carved into a mountain for eternity isn’t good enough for ’em?! My ex has a heart of stone and a face of granite. Wait a sec! Are our ex-wives related…?? We should just get rid of change all together! Yeah, 1980 was OK for me. You are hysterical….I get what you mean! My favorite, Benjamin Franklin, wasn’t even a president. And that money man Hamilton’s on the $10 and he was born in Jamaica. Yes those old nickels now look great on belts and as cuff links. Not just smilin’ LOLin’. Hilarious. Just goes to show you. No one is ever satisfied. Sigh. Then there’s that whole clash about postage stamps. Just a bunch of ingrates! 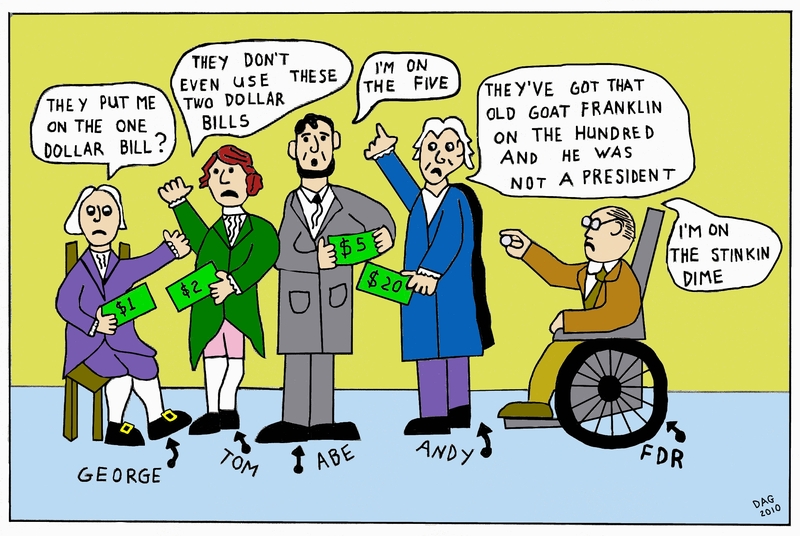 Some presidents should have their face on toilet paper. Ha ha ha. Point well taken. Geez! They should have MY face on them green papers! Omg, you did it again, Carlo … make me smile, I meant to say … Thank you … Love, cat. They were going to put Clinton’s ‘head’ on a bill, but Monica was unavailable.. Heads or tails a win/win for all. I’ve never heard of Tom and Andy. Mind you I have no USD$. Happy Pres Day. Good one. Were oak leaves and ducks PM’s up there ? …and I forgot to add – good one! Thanks. It really is one of my personal favorites.